A black and white large format negative of Mrs. Harry MacKendrick and her champion Boxer at the Canadian National Exhibition. 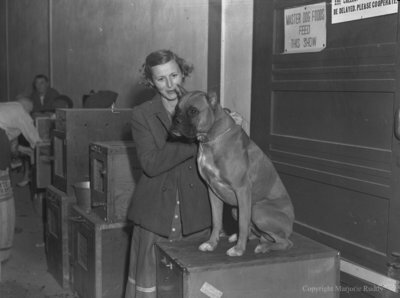 The title was awarded from the Toronto Kennel Club. Mrs. MacKendrick and Boxer, September 2, 1949, Marjorie Ruddy. Whitby Archives A2013_040_330.